2020 ITS provides an online Inventory control management system which can be integrated to most restaurant point of sale systems. When a menu item (PLU) is sold, our tracking system will theoretically consume the portions of stock item ingredients contained in the menu item recipe which enables the system to determine the current balance of each stock item. This enables the system to determine when (and how much) to order. And when stock is physically counted, the system can generate variance reports detailing stock balance discrepancies. 2020 ITS's solution is complete and its online 24x7. All stock taking features such as count sheets, inventory balance data entry, variance reporting (theory balance vrs actual balance), usage and turnover percentages are provided. 2020's online solution also manages the entire ordering cycle, from theory balance based ordering, ordering based upon projected sales and or course, ordering based upon physical stock count. 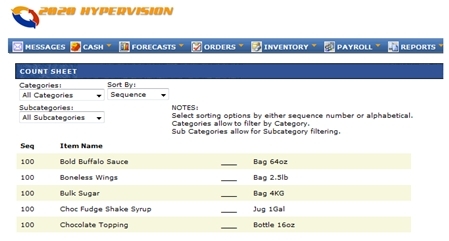 HyperVision™ is also capable of electronic ordering to major vendors such as Sysco. Imagine eliminating the manual process of phoning in an order. And with our no-fill and back order features, shortages are automatically tracked. We even provide a report notifying you of items whose stock balance is critically low or out of stock. HyperVision™ also takes into consideration (and provides functions or definitions for) more complex functions such as recording and reporting wastage and ingredient yield. This enables you to determine when you have a portioning or pilferage issue. And with our POS integration, you can determine (with physical count spot checks of the item concerned) exactly when discrepancies occur. Our clients state HyperVision™ has helped them identify problems such as a "Harry Heavy Hand" server or cook. They also swear our inventory management system saves them at least 10 hours a week and has helped them easily pin-pointing problems which could have cost them $1000's per month. You owe it to yourself to find out more about our complete, online inventory control management solution. There's no hardware to buy, just pay a low monthly fee to subscribe to the service. You'll save thousands before a penny leaves your bank account. Let HyperVision™ be your best inventory control accountant and start making more profit today. Call 1 (800) 465-2400 or Contact Us now.